Happy New Year! To celebrate surviving the festivities of the Christmas break, we will be back on Tuesday 9th January to begin preparations for July (we like to wish the year away!). Singing some of the songs featured in our Family and Friends Party, we will also be adding a whole host of new material for our annual Concert. Fancy having a try? Come down for a free trial rehearsal on Tuesday at 7:30pm or contact us with any queries. 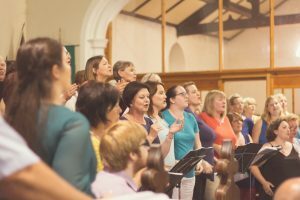 Previous Previous post: Welcome to BIGMOUTH Chorus! Next Next post: Hark! What news?